I find myself baking in earnest as the weather turns cold each fall. It warms my home and fills my kitchen with wonderful smells that seem to keep the chill away. There’s also nothing quite like fresh-baked muffins on a cold day or first thing in the morning. Although there are old standards I make every year, I’m always looking for tasty new recipes. Moufflet: More Than 100 Gourmet Muffin Recipes That Rise to Any Occasion provides a selection that will keep me happily baking until spring. If you’re wondering about the title like I was, it’s simply a French word for muffin, and simple is a great way to describe these recipes. They offer a huge variety, from sweet to savory, but none are overly complicated. These are muffins, not main courses, so they are by their very nature simple. What this book offers are combinations of flavors and ingredients that are unique and new. It’s divided into three sections, beginning with “Sweet Escapes,” which features recipes like Pistachio Rose Water, Double Shot Espresso, Cranberry Orange Streusel and Peppermint White Chocolate Muffins. The recipes are clearly written and easy to follow so even a novice baker will be able to produce a fantastic treat. The second section is “Savory Sensations” and focuses on recipes that are perfect as a side at meals, especially brunch. Goat Cheese and Leek, Cheesy Shrimp, and Pepper Jack Chorizo are just a few of the savory muffins you’ll be able to create. The third section, “To Top It Off,” showcases a wonderful variety of finishing touches. There are butters like Whipped Honey Lavender, Smoky Cayenne and Salted Carmel and cheese spreads like Blue Cheese Walnut and Jalapeño Cheddar. Lastly, there are toppings like Butterscotch Glaze, Peanut Butter Drizzle and Cinnamon Pecan Streusel that will have your mouth watering. 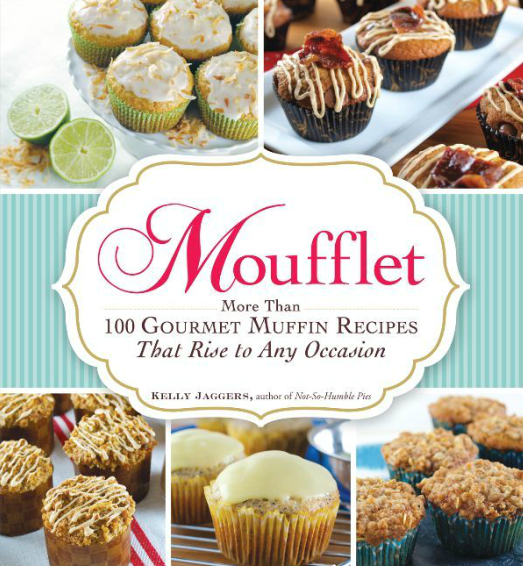 Moufflet: More Than 100 Gourmet Muffin Recipes That Rise to Any Occasion ($18.95) is a great addition to any baker’s library and will provide plenty of fresh ideas, just in time for all your holiday baking.